North Carolina's "bathroom bill" just cost the state 400 future jobs. PayPal has canceled its plans to open a new global operations center in Charlotte, following passage of a North Carolina law that prevents cities from creating non-discrimination policies based on gender identity. 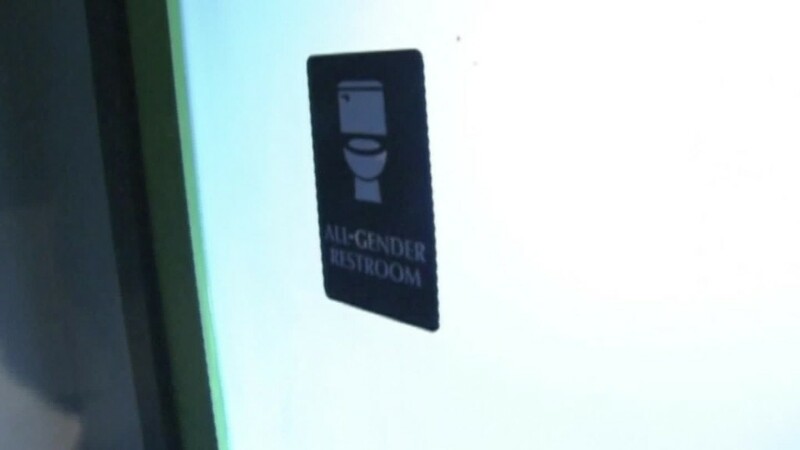 The measure also mandates that students in state schools use the bathroom that corresponds with their gender when they were born. On March 23, North Carolina, in an emergency session, passed the controversial Public Facilities Privacy & Security Act. Critics have blasted the law for excluding gays and transgender people from legal protections. As a result, PayPal (PYPL) says it will no longer open its facility in Charlotte, which was expected to employ 400 people. PayPal had announced its plans to open the operations center only two weeks ago. 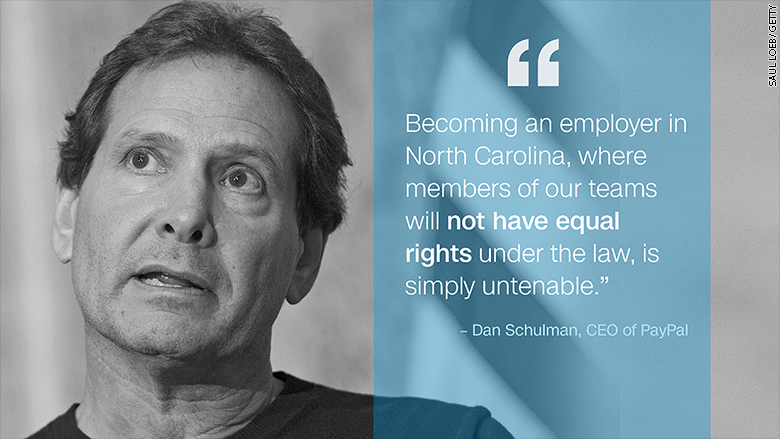 "Becoming an employer in North Carolina, where members of our teams will not have equal rights under the law, is simply untenable," PayPal CEO Dan Schulman said in a statement. "The new law perpetuates discrimination and it violates the values and principles that are at the core of PayPal's mission and culture." PayPal is known to be a supporter of LGBT rights. The company earned a 100% ranking on the Human Rights Campaign Foundation's 2016 Corporate Equality Index, a national report on corporate policies related to LGBT workplace equality. In addition to PayPal, more than 100 other companies joined in protest of the law. But PayPal is the first to announce that it has canceled plans to add jobs in the state. The company said its decision not to build its Charlotte facility "reflects PayPal's deepest values and our strong belief that every person has the right to be treated equally, and with dignity and respect." Schulman called PayPal's reversal "clear and unambiguous." While the company looks for an alternative location for its operations center, he said PayPal will work to help overturn the discriminatory law. "We will stand firm in our commitment to equality and inclusion and our conviction that we can make a difference by living and acting on our values," Schulman said. "It's the right thing to do for our employees, our customers, and our communities." North Carolina Governor Pat McCrory said despite PayPal's decision, he expects it to continue to "provide their services and accept consumer money in the state of North Carolina." Mississippi passed a religious freedom bill on Tuesday that many have criticized as discriminatory against the LGBT community. Proponents say it is designed to protect people's religious beliefs. Many other states has passed similar laws in the recent past.